Ever wondered How Tech does Quality? What are their strategies when it comes to Quality and Testing? How do they increase speed to market without compromising on quality? 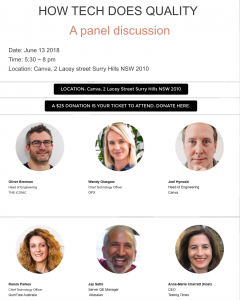 Why not come and join me and a panel of Sydney Tech Leaders on the 13th June 2018 at the Canva Office to find out? Tickets cost $25 AUD all proceeds go to HeadSpace. Atlassian, OFX, THE ICONIC, GumTree Australia and Canva will discuss their companies approaches to Quality and Testing. Why they work in the way they do, its advantages and disadvantages. They will explore how new trends are impacting approaches to Quality and will share some thoughts on what the future may look like in this space. What does quality mean to your company? What challenges have you faced in trying to achieve this? How has that affected your strategy? What advice would you give other companies on quality? What advice would you give people in the quality space? Crystal ball question: What are the biggest impacts on quality in the future?